A new theme park is built on the original site of Jurassic Park. Everything is going well until the park's newest attraction--a genetically modified giant stealth killing machine--escapes containment and goes on a killing spree. Back in 1993, Jurassic Park became a major sensation and spawned two sequels: 1997’s Lost World and 2001’s Jurassic Park III. Both of those films did well at the box office, but they showed obvious signs of diminishing financial returns. After the first movie made $357 million in the US, Lost World settled for $229 million, and Park III ended up with $181 million. That meant both sequels did fine, but their receipts didn’t inspire tons of confidence from the studio, especially given the massive budgets involved. Actually, by today’s standards, the first three movies didn’t cost exorbitant amounts, but they weren’t exactly cheap, either. Because of this, it took 14 years for another entry in the franchise to hit screens. When it did, 2015’s Jurassic World reminded folks how potent the series could be – and its $651 million in the US ensured fans wouldn’t need to wait very long for another dino adventure. Since Park III, corporate CEO Simon Masrani (Irrfan Khan) brought to life John Hammond’s dream: a theme park based around genetically engineered dinosaurs. Located near Costa Rica, “Jurassic World” becomes a global tourist magnet. In the never-ending quest for visitors and money, park administrators feel the need to develop bigger, badder creatures, and as a result, the geneticists create an enormous beast called the “Indominus Rex”. A smart dino, the Indominus manages to escape from her pen and she wreaks havoc on Jurassic World. Led by dino wrangler Owen Grady (Chris Pratt) and operations manager Claire Dearing (Bryce Dallas Howard), humans attempt to save the day. Often when I see a movie theatrically, I’ll write my review of it right away. Usually this works fine, but occasionally it backfires because I change my mind between big-screen and home theater viewings. I didn’t pen my thoughts about World when I first checked it out in May 2015, and I’m glad I didn’t, because I did alter my opinion of it. While I didn’t much care for it after that initial screening, subsequent revisiting allowed me to better see its positives. Before I go into the reappraisal, I’ll discuss my original thoughts. On first viewing, I considered World to be all sizzle, no steak, mostly because the characters were so forgettable and dull. At least the first two sequels brought back participants from the original - characters we knew and found interesting. Lost World offered Jeff Goldblum and Park III involved Sam Neill, but the best World can do is BD Frickin' Wong! I thought the kids were just updates on the first film’s Lex and Tim, and I never cared about them. Granted, I'm not sure I cared a lot about Lex and Tim, either, but at least the original movie invested in them more than this one. Zach (Nick Robinson) and Gray (Ty Simpkins) were Generic Kids to Be In Danger and that was it. If the adults became more compelling, maybe I wouldn't mind, but they were duds as well. I like Pratt and Howard but they got parts with no substance at all and felt like they existed as characters just because the movie needed some "good" adults involved. Vincent D'Onofrio also seemed like he was there as Token Bad Guy. I can’t explain what changed when I saw World again, but my opinion did alter, mainly in terms of basic enjoyment. Whereas I found myself somewhat bored with the movie initially, subsequent screenings allowed me to better appreciate the action. I suspect some of my disenchantment in May 2015 came from the nature of the action scenes, perhaps because it takes a while for the flick to really kick into gear. I think the first half establishes circumstances and characters fairly well, but it dollops out the dino doings a little too slowly. The initial act still works, but it can be a bit slow. Once the I-Rex escapes, though, the movie gets more interesting. Matters progress in a crazed way that ensures we get all the requisite mayhem we desire. 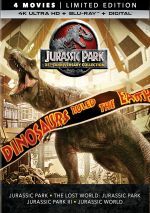 The film boasts pretty solid production values and creates a believable, impressive sense of the dinosaurs and the park. Despite my reappraisal, some parts of my original criticism remain intact. On second – and third and fourth – screenings, I still don’t care much about the kids, and the other humans continue to seem fairly generic and forgettable. And yeah, I’m still disappointed World didn’t bring back any of the major actors from the original film. No offense to Wong, but he’s not a substitute for the first flick’s leads. Nonetheless, World does offer an exciting, fun experience. Even with its problems, it renews the franchise in a mostly lively manner that becomes a satisfying experience in the end. Jurassic World appears in an aspect ratio of approximately 2.00:1 on this Blu-ray Disc. Though usually very good, some inconsistencies impacted the presentation. Actually, my only real complaint came from print flaws, as the movie showed occasional examples of small specks. While these remained infrequent and largely unobtrusive, a big-budget film from 2015 shouldn’t show any defects of this sort. Sharpness always looked good. From start to finish, the movie offered nice definition, with positive clarity and accuracy. I saw no shimmering or jaggies, and the image also lacked edge haloes. Don’t expect anything out of the ordinary from the film’s palette, as it emphasized teal like so many other movies these days. Some amber also popped up, but the bluish tint dominated. That was uncreative but the hues seemed well-rendered, and the 4K UHD’s HDR made the colors more dynamic. Blacks also came across well. Dark tones appeared deep and rich, and low-light shots brought us smooth, clear imagery. The unnecessary print flaws knocked off some points, but overall, this remained an appealing presentation. When you bought your fancy-pants home theater, you did so for material like the dynamic DTS-X soundtrack of Jurassic World. Downconverted to DTS-HD MA 7.1, the mix offered audio elements that appeared well-placed and balanced. Music showed good stereo presence, and quieter moments exhibited a fine sense of place and atmosphere. Of course, you didn’t buy World - or the aforementioned home theater – to listen to the film’s “quieter moments”, and the flick’s many action sequences kicked into high gear. Dinosaurs stomped around the room to convincing effect, and fights/chases related to those critters cranked in fine fashion. The whole package combined to give us a vibrant, lively soundscape that used the various channels in an exciting manner. Audio quality seemed top-notch. Effects became the most substantial element, and they appeared accurate and full, with vivid low-end response. Music was peppy and rich, and speech came across as natural and accurate. The movie’s soundtrack added a lot to the movie and totally satisfied. How did the 4K UHD compare to the Blu-ray version? Audio showed a bit more breadth and oomph, as the DTS-X mix added some life. Visuals became more of a mixed bag, though. On the positive side, the 4K UHD boasted bolder colors and improved definition. On the negative side, it looked substantially grainier than the Blu-ray, and it also came with print flaws that didn’t appear on the 2015 release. Ultimately the 4K UHD’s visuals did work better, but the image’s drawbacks made this a more tepid endorsement than I’d like – and I couldn’t blame anyone who opted to stick with the Blu-ray. No extras appear on the 4K UHD itself, but the included Blu-ray copy offered the same features from 2015, and seven Deleted Scenes fill a total of six minutes, eight seconds. Most of these offer short character moments, except for the one that provides a long character moment. The latter comes from a goofy sequence in which Owen and Claire smear dino dung on themselves to cover their scene. Beyond its callback to the giant dino crap scene from the original movie, it’s too silly to succeed. The other moments have some merit but don’t add to the story. A few featurettes follow. Chris and Colin Take on the World goes for eight minutes, 57 seconds and offers director Colin Trevorrow and actor Chris Pratt as they chat together about Pratt’s casting, favorite Jurassic moments, Trevorrow’s approach to the material, and other aspects of the shoot. Matters remain chummy, so don’t expect much depth, but the conversation remains enjoyable and tosses out a couple of good tidbits. During the 29-minute, 52-second Welcome to Jurassic World, we hear from Trevorrow, Pratt, executive producer Steven Spielberg, co-writer Derek Connolly, producers Frank Marshall and Patrick Crowley, production designer Edward Verreaux, stunt coordinator Chris O’Hara, puppeteer John Robert Rosengrant, costume designer Daniel Orlandi, and actors BD Wong, Jake Johnson, Bryce Dallas Howard, Ty Simpkins, Nick Robinson, Omar Sy, Irrfan Khan, Vincent D’Onofrio, and Lauren Lapkus. We learn how Trevorrow came to the project, story/characters, cast and performances, sets and locations, stunts and action, and animatronics. “Welcome” can be a little more general than I’d like, but it touches on good topics and does so well enough to succeed. Dinosaurs Roam Once Again lasts 16 minutes, 29 seconds and features Pratt, Trevorrow, Spielberg, Simpkins, Howard, D’Onofrio, Marshall, Crowley, ILM senior VFX supervisor Dennis Muren, ILM data wrangler Chris Moore, visual effects supervisor Tim Alexander, visual effects animation supervisor Glen McIntosh, director of photography John Schwartzman, dinosaur consultant Phil Tippett, digital creature model supervisor Geoff Campbell, and actor Katie McGrath. Here we learn about the visual effects used in the movie as well as creature design. “Roam” offers a nice overview of those areas. In Jurassic World: All Access Pass, we get a 10-minute, 11-second piece with Pratt and Trevorrow. They discuss characters/performances, the gyrosphere, the motorcycle and military scenes, and the movie’s climax. “Pass” feels like it was intended to be part of a picture-in-picture pop-up feature. It offers some fun info but it seems oddly disjointed and scattered. Next comes Innovation Center Tour with Chris Pratt. It fills two minutes, one second with Trevorrow, Pratt and Verreaux, as we get a closer look at the movie’s visitor center. It’s quick but enjoyable. Finally, we find Jurassic’s Closest Shaves, a three-minute compilation of scenes from the various movies. It becomes a decent reel, even if it mostly exists as an ad for a shaving cream company. The disc opens with ads for the Back to the Future trilogy, Minions, Ted 2, Tremors 5: Bloodlines, Self/Less, The Gift, Jarhead 3: The Siege, Lego Jurassic World, RL Stine’s Monsterville and the Universal Studios Jurassic Park ride. No trailer for Jurassic World appears here. 14 years after the last film in the series, Jurassic World proves there’s still life in those dinosaur bones. While not the best of the franchise, World overcomes some flaws and mostly brings us vibrant, lively action-adventure. The 4K UHD delivers excellent audio as well as a decent set of supplements but picture slightly disappoints. Jurassic World entertains but the 4K UHD doesn’t look as good as it should. Note that as of August 2018, this 4K UHD version of Jurassic World can only be purchased via a four-movie package. 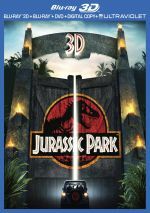 The “Jurassic Park 25th Anniversary Collection” also includes 4K UHD versions of Jurassic Park, The Lost World, and Jurassic Park III.